Consumers with active outdoor lifestyles looking for a crossover with sporty good looks, a performance attitude, and a base price under $30,000.00, have a small number of vehicles to choose from. The all-new 2010 Outlander GT gives consumers more sporty cues inside, performance under the skin, seating for up to seven passengers, a fold-down tailgate for easy loading/unloading, with a towing capacity of up to 3,500lbs., when properly equipped. 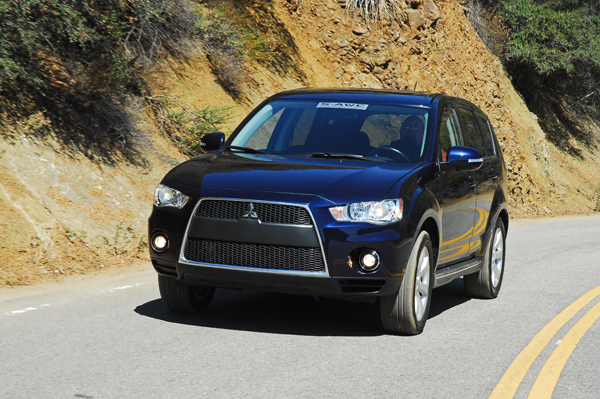 The 2010 Mitsubishi Outlander GT has it all. The unique good looks are highlighted with the distinctive ‘jet fighter’ front grille with protective honeycomb mesh, beautifully formed headlamp clusters with HID lights, a blacked out front bumper cover design with round fog lamps, a lightweight aluminum roof that lowers the center of gravity enhancing handling capability, a new raised hood, new front and rear flared fenders, new door mirrors, new rear quarter panels, new lower side extensions with a chrome strip, new rear LED light clusters, new rear roof-mounted spoiler, new dual exhaust tips, and a chrome strip around the lower greenhouse beltline with an obtuse rear angle showing forward motion. Outlander GT now has a style that shows bold and aggressive styling to go along with its combination of performance and premium materials. 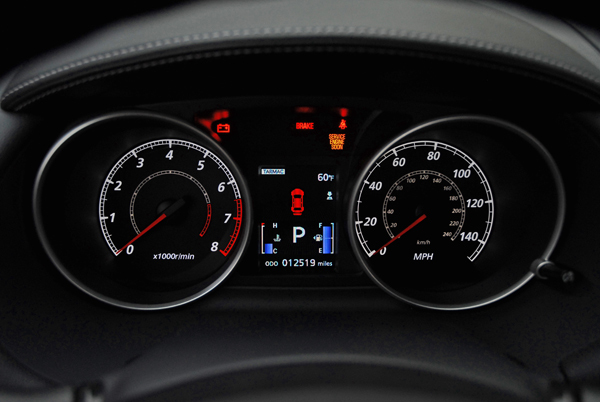 Inside, the Outlander GT displays a premium feel wit upscale features such as double-stitched synthetic leather on the dashboard and upper front and rear door trims, a new, easy-to-read, high-contrast, multi-color LCD instrument cluster with a 150mph speedometer, 8,000rpm tachometer and two bar graphs showing fuel on board and engine coolant temperature. LED readouts show which all-wheel-drive setup (Tarmac or Sand) that you can choose by turning the big knob on the center console, comfortable and supportive sport bucket seats with 6-way driver’s seat, chrome accents surround the air outlets knobs and automatic climate control dials, metallic accents on the air outlets, door armrests, center console with chrome accents surrounding the gated shift lever. The GT comes with aluminum gas and brake pedals. All dials, switches and levers are within easy reach for ease of use. 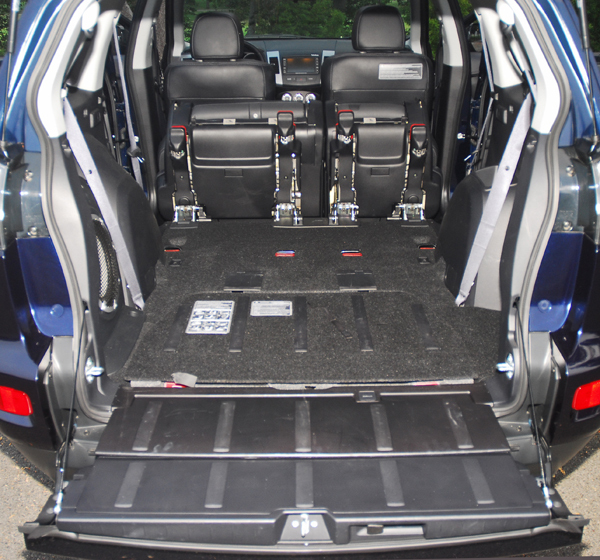 Five seat Outlander models offer an under-floor storage compartment in the rear, the second-row seat employs a 60/40 split fold-and-tumble seat backs that expand cargo capacity. 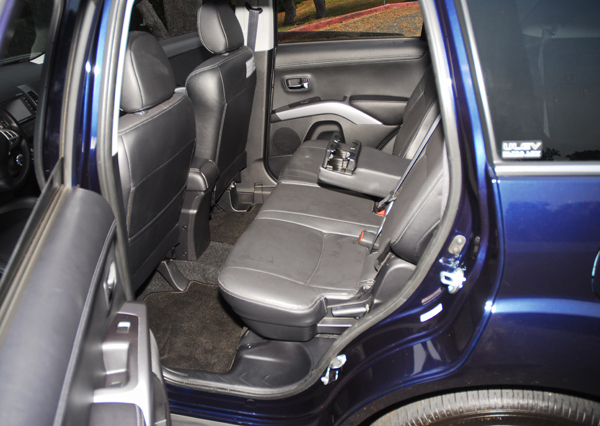 With the second row seats up, cargo room measures 36.2cu.ft. and 14.9cu.ft. behind the third row seats. 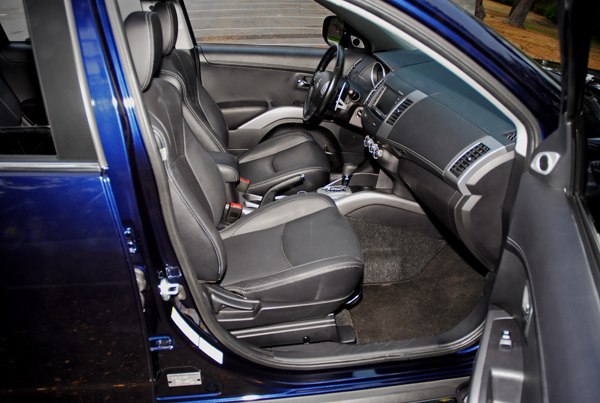 The GT’s second row seats independently offer 3.3in. fore/aft slide range to optimize passenger room or cargo room as needed. 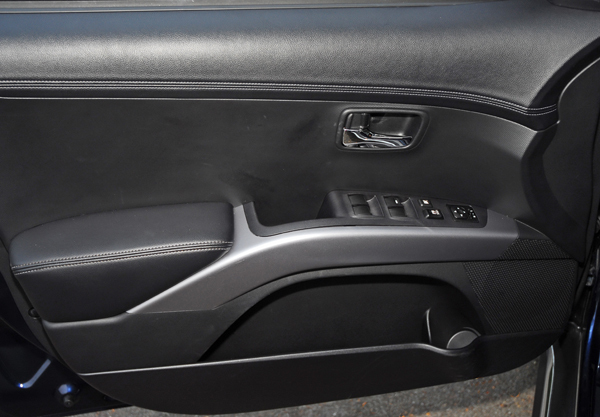 Maximum cargo volume behind the front seats measures 72.6cu.ft. and loading bicycles or large packages is made easier by the segment’s first and only flat-fold tailgate. When lowered, the tailgate can also serve as a seat for outdoor activities with a capacity of 440lbs. Ample storage spaces include useful bins and compartments, a movable front center console armrest and door-panel bottle carriers. 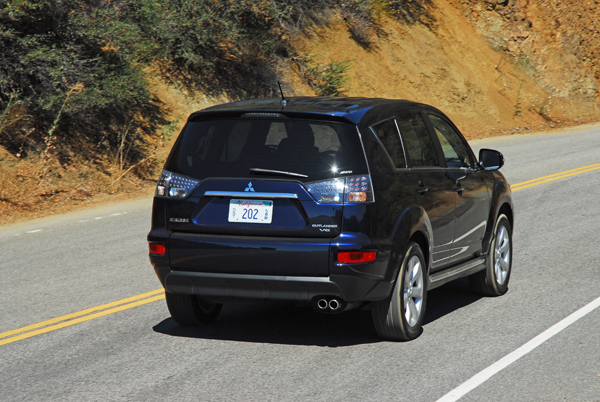 The Outlander GT can tow up to 3,500lbs. when equipped wit the trailer tow package. Generous standard equipment includes Active Stability Control (ASC), Traction Control Logic (TCL, ABS and Electronic Brake Force Distribution (EBD) brake control systems, AC, cabin air filter, ambient lighting monitor, cruise control, power windows, locks and mirrors, two 12-volt accessory plugs, leather wrapped/tilting, sporty steering wheel with audio controls, front/rear floor mats, variable-speed intermittent wipers/washers, rear wiper/washer, dual map lights, grab handles above each door, chrome inside door handles, door slots for storage, a map pocket behind the front seatback, rear privacy glass, engine immobilizer and anti-theft system, keyless entry, and a 710-watt Rockford-Fosgate premium sound system with nine speakers, including a 10in. dual-voice coil subwoofer with Punch Control, digital signal processor, 3-band equalization, speed compensated volume, an all-new FUSE Hands-free Link system featuring Bluetooth 2.0 hands-free calling and streaming music, USB connection for iPod and MP3 player interfacing, voice-activated music or phone commands, automatic phonebook transfer, and other advanced calling features. The interior is a comfortable and premium outfitted space with sporty cues to enjoy the flexible, yet performance-driven experience behind the wheel. Premium goodies under the skin further provide the performance that is not typical of a crossover sport utility vehicle. 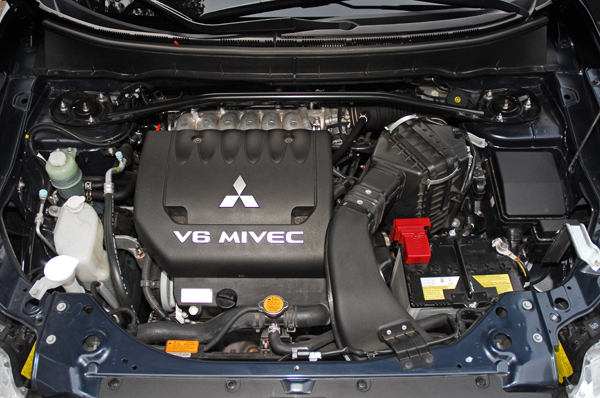 Powering the GT is a revised, 230hp, 3.0 liter MIVEC (Mitsubishi Innovative Valve-timing Electronic Control) that controls valve timing on both the intake and exhaust camshafts to optimize performance at all engine speeds. Torque is rated at 215lb.ft. at 3,750rpm with nearly 90% available from just 2,000rpm for fantastic launch capability. This high-performance all-aluminum engine is mated to a six-speed Sportronic automatic transmission with magnesium steering wheel paddle shifters. You can also change gears by placing the shifter into a side gate with upshifts up and downshifts back. Gear changes are almost instantaneous increasing the excitement that you’ll feel as you increase or decrease your speed. The Sportronic automatic transmission also provides increase fuel economy with the new addition of ‘Idle Neutral Logic’ (INL), by automatically selecting neutral whenever the vehicle comes to a stop, fuel consumption is reduced. The Outlander GT features the advanced technology and all-weather capability of the Super-All Wheel Control (S-AWC) system and Hill Start Assist. The S-AWC system utilizes a first-in-class Active Front Differential (AFD) and an electronically control center differential system, which distributes driving force intelligently front to rear and left to right to the front wheels to enhance stability. 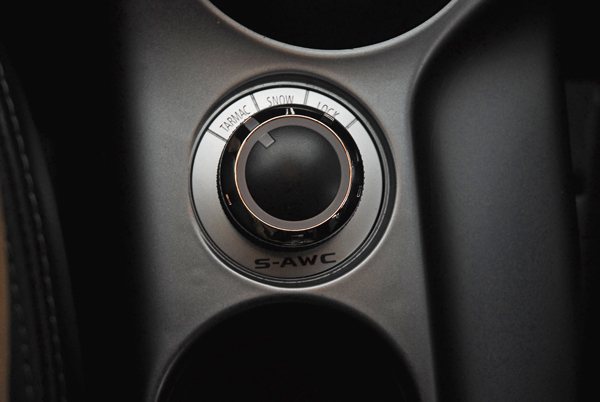 You can change from ‘Tarmac/Snow or Lock selector knob to switch between modes, providing full-time traction during any weather condition. Outlander GT is based on a performance-engineered global platform that also forms the foundation of the new-generation Lancer and Lancer Evolution models. 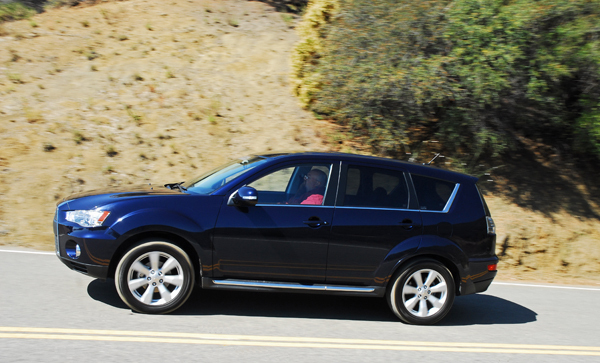 The result is a crossover that delivers handling dynamics, stability and driver engagement uncommon in the segment. A highly rigid unibody structure, which makes extensive use of high-strength steel, allows for sport-oriented suspension tuning while also providing a smooth, compliant ride. Front suspension strut tower braces enhance lateral rigidity for precise, quick steering response from the variable-assisted rack & pinion steering system. The fully independent suspension system features MacPherson struts and a 22mm stabilizer bar up, with a multi-link setup in the rear featuring gas-charged shocks, coil springs and a 20mm stabilizer bar, providing an excellent balance of handling performance and ride comfort. 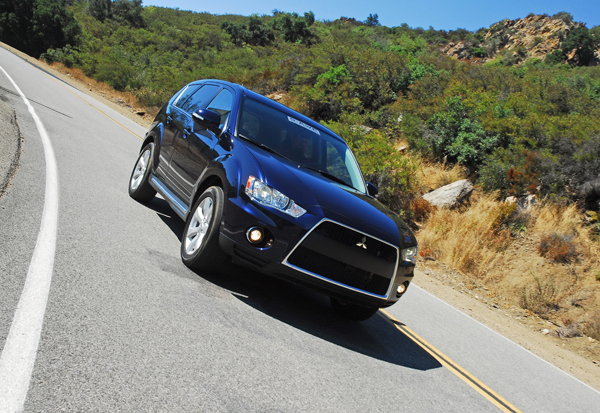 Slowing and stopping the Outlander GT down from speed are large, power-assisted, four-wheel disc brakes. Up front are 11.6in. vented discs clamped with dual-piston calipers, and 11.9in. solid discs clamped with single-piston calipers in the rear. The Outlander GT rides on large, 18X7in. 7-spoke, silver painted, aluminum alloy wheels wrapped with 225/55R18n. high-performance, all-season radial tires that enhances traction and grip. 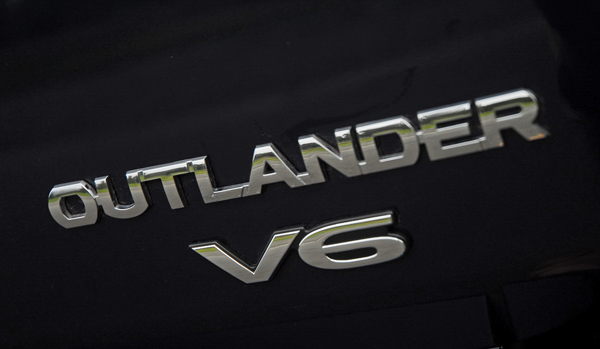 The Outlander GT safety package is one of the most comprehensive in the segment and includes an advanced dual-stage front airbags supplemental restraint system with occupant sensors, standard front-seat mounted side-impact airbags, and side curtain airbags with roll-over sensors for the front and second row, 3-point safety belts all-around plus front load limiters/pretensioners, plus energy-absorbing head protection interior pillars, front/rear crush zones, steel beams in each door and a tire pressure monitoring system. 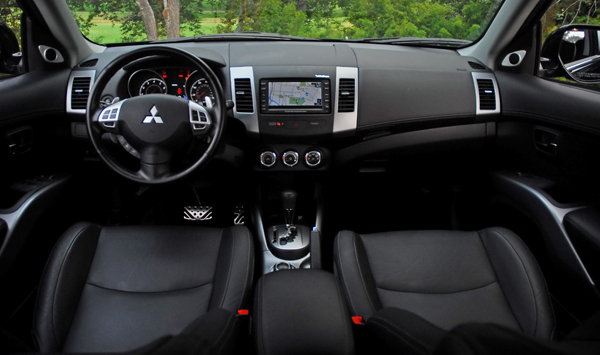 Options in my Outlander GT test vehicle included the factory-equipped 40-gigabyte HDD navigation system with music server and new for 2010 Real-Time Traffic and rear-view camera. The navigation system features Diamond Lane Guidance, an industry-first development that gives you HOV lane information included with directions to help reduce driving times, leather/heat front seats, and an electric, one-touch sunroof. 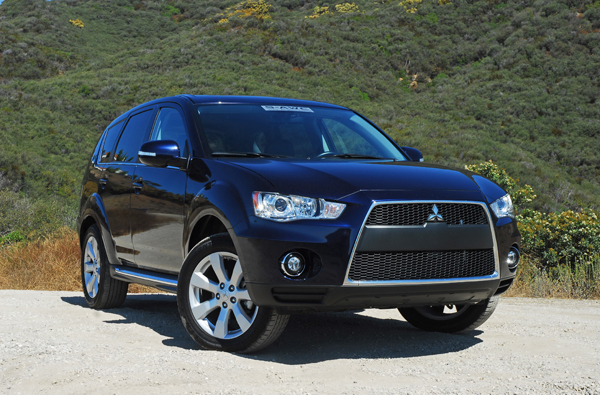 High-performance driving, commuting, taking care of personal daily chores and the all-activity flexibility of a sport utility can all be your when you purchase the all-new 2010 Mitsubishi Outlander GT crossover. It is fun and easy to drive and I totally enjoyed my seven-day test drive. Front Head Room: 39.8 in. Front Hip Room: 52.2 in. Front Shoulder Room: 56.4 in. Rear Head Room: 37.5 in. Rear Shoulder Room: 56.1 in. Rear Hip Room: 51.9 in. Front Leg Room: 41.6 in. Luggage Capacity: 14.9 cu. ft. Maximum Cargo Capacity: 73 cu. ft. Acceleration (0-60 mph): 7.9 sec. Braking Distance (60-0 mph): 130 ft.
Fuel Tank Capacity: 15.8 gal. Automatic: 284.4 mi. / 379.2 mi. / 316 mi.